Head lice are small, wingless insects that live in the hair on your head and feed off the blood from your scalp. A louse (a single adult) is about the size of a sesame seed. A louse egg is about the size of a small flake of dandruff. Head lice lay eggs which stick to strands of hair very close to the scalp. Once the egg hatches the empty case left behind is called a nit. Lice can be transferred by brushes, combs, barrettes, headbands, headphones, hats and clothing that has been touched by infected hair. They can also live for a time on upholstered furniture, bedding, towels, or clothing. scratch marks or small red bumps like a rash. How do I prevent the spread of head lice? Head lice can best be controlled through the cooperation of parents, children, and the school. Checking the hair of all family members weekly using the wet combing method (see below) is the best way to prevent the spread. Encourage your children not to share hats, combs, hair accessories, or hairbrushes. If your child has long hair, tie it up or put it in a braid. If your child does have head lice tell your class teacher so they can ask other parents in the class to check their children. Wash and rinse the hair. Apply enough conditioner to cover the whole scalp (usually 2 handfuls). The conditioner stops the lice from moving, making them easy to find. Use a wide tooth comb to get the tangles out. Begin combing the entire head with a lice comb. Pull the comb through the hair in one stroke from the front to the back of the head. Keep the teeth in contact with the scalp for the entire stroke. After each stroke, wipe the comb on a paper towel and check for lice. If no lice are found you're good. But, repeat the above process weekly to be sure. Having head lice once does not prevent someone from getting them again. This method removes live head lice. Wet combing is less expensive and non-chemical. Combing treatments are done following the same steps used to check for lice. 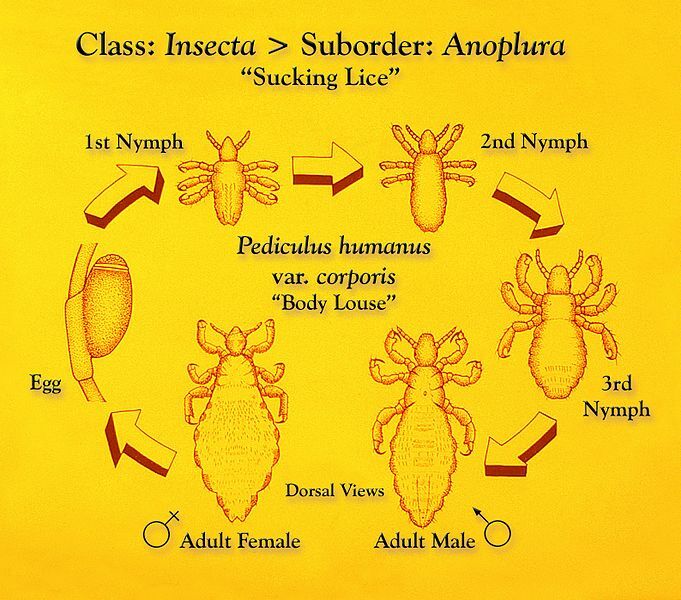 Any young lice, that hatch from eggs after the first session are removed at the second, third and fourth sessions. This is why it is important to do the full series of sessions. Use generous amounts of hair conditioner and a special lice comb, every 4 days for at least 2 weeks. If lice are found on the final combing, add one more combing in 4 days until no live lice are found. Many shampoos, creams, rinses and sprays that contain an ingredient that kills lice are available at most pharmacies without a prescription. These products may not be appropriate for children or adults of all ages, so check with your health care provider or the pharmacist to find out which is best for you or your children. The key to success is ensuring that you follow the instructions on the products carefully. After treatment, the hair should be checked by wet combing and eggs and lice should be removed. Clinical studies have also shown that tea tree oil has a toxic effect on lice and eggs and can be used for treatment and prevention. Tea tree oil treatments can be found at pharmacies and natural health retailers. The Greater Vancouver Lice Clinic also has a helpline you can phone for free advice and support. The number is 778 984 5423.